Soybean research is about more than field conditions and yield. At the University of Guelph, it’s also about finding market opportunities for soy products. That means research collaboration and extension – that is, telling soy’s story – is growing in importance. Dr. Alison Duncan, from the Department of Human Health and Nutritional Sciences, exemplifies research extension. She traveled to Chile last fall to speak to the Latin America Society of Nutrition about her soybean research. She’s found that consuming soy protein can reduce the risk of heart disease in those with Type 2 diabetes. She also disseminates current soy-related research findings to industry through a column entitled News Report on Soy and Human Health to Soy Food Canada’s quarterly newsletter. Fluctuations in prices make timing an important consideration for corn sales. Although marketing tools are available, data is limited when it comes to helping growers determine the appropriate strategy to use for maximum returns. A lack of information about the most effective marketing tools prompted Dr. Richard Vyn of the University of Guelph’s Ridgetown Campus to develop a simulation model that compares and evaluates returns from various marketing strategies for corn growers. The study evaluated 18 marketing strategies, using marketing tools such as cash sales, forward contracts, futures contracts, options, a basis contract and a combination of strategies. Of the marketing techniques evaluated, futures contracts and options tended to provide the best returns. Specifically, these pre-harvest marketing tools provide the best returns when prices in the spring are higher than the cost of production. However, when pre-harvest prices are lower than the cost of production, these tools do not provide higher returns than other marketing strategies, such as cash sales. Vyn advises growers to combine different strategies over time and to understand when these strategies may provide more profitable results. He also plans to use a similar model to study marketing strategies and evaluate returns for soybeans. 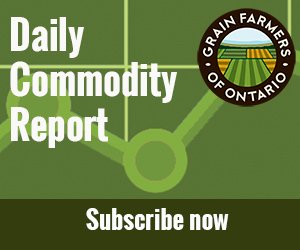 In Ontario, winter wheat yields are 50 percent higher than spring wheat. However, plant breeders are restricted to one generation a year when growing winter wheat, compared to spring wheat which can generate up to three generations of data, with the use of greenhouses. To give farmers the best of both worlds, a University of Guelph researcher has found a way to give farmers the ability to grow winter-hardy spring wheat. Dr. Duane Falk, a cereal breeder in the Department of Plant Agriculture, is working with graduate student Jamie Larsen to remove the vernailization requirement (the three-month cold period winter wheat needs before it can begin flowering) from winter wheat. “Removing this period could speed up breeding and trait improvement dramatically and allow winter wheat to grow indoors during the warmer winter season,” says Falk. The researchers crossed winter wheat and spring wheat varieties, and selected spring wheat genes segregated out of that cross. Crossing these segregated spring wheat genes with winter wheat produced winter hardy spring wheat that breeders can grow without the vernalization requirement.